One thing about salads from the far east is the abundance of herbs and spices. This is not your ordinary "house salad" (the house salad being the obvious exception). These creations are packed with flavor. Lettuce, tomato, egg, tofu and cucumber with a side of peanut dressing. Shredded green papaya, green bean, tomato, and peanuts in spicy lime dress-ing, served with lettuce. Add shrimp for $2. Ground chicken or pork or tofu with roasted rice powder, fresh mint, green onion, cilantro in spicy lime dressing, served with lettuce. Thai grilled beef salad with tomato, fresh mint, onion and cucumber in spicy lime juice, served with lettuce. Shrimp, roasted rice powder, green onion, lettuce, onion, tomato, and cilantro in spicy lime dressing. Ground pork, shrimps, glass noodle, onion, cilantro, tomato in spicy lime dressing. 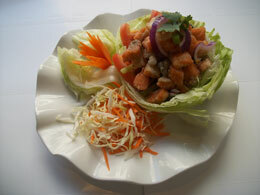 Deep fried Salmon, cilantro, tomato, onion, celery in spicy lime dressing with side of lettuce. 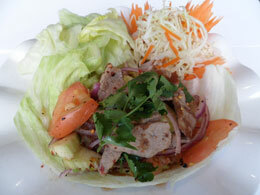 Thai grilled duck salad with tomato, green onion and cucumber in spicy lime juice, served with lettuce. Steamed seafood medley, mint, green onion, and cilantro with spicy line dressing, served with lettuce, onion, and tomato.